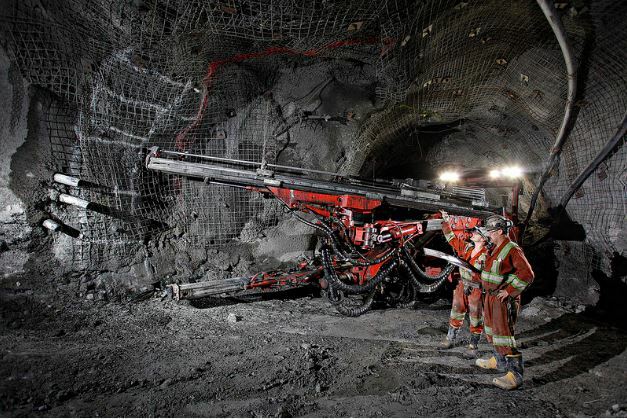 Underground mining operations Goldcorp’s Red Lake, Ontario gold mine. Source Goldcorp Inc.
As the old saying goes, the best place to discover gold is in an area where the yellow metal already exists. It helps to explain this week’s announcements by two companies who have made acquisitions in the Red Lake District of northwestern Ontario. One is Pacton Gold Inc. [PAC-TSXV; PACXF-OTC]. The other is Nexus Gold Corp. [NXS-TSXV; NXXGF-OTC]. The Red Lake area is about 100 km from the Manitoba border and has produced over 29 million ounces of gold since 1949. It is home to Goldcorp Inc.’s [G-TSX; GG-NYSE] Red Lake and Campbell underground mining and processing operations, which was expected to produce 235,000 ounces of gold in 2018, employing roughly 1,000 employees and contractors. As the local community waits to see what impact the acquisition of Goldcorp by U.S. gold mining giant Newmont Mining Corp. [NEM-NYSE] will have on those operations, other players are working hard to revive some of the area’s historic former mines and make brand new discoveries. Among them is Pure Gold Mining Inc. [PGM-TSXV, which has just announced the results of a positive feasibility study for its 100%-owned Madsen-Red Lake Project. The feasibility study sees Madsen-Red Lake as an 800-tonne-per-day, high-grade underground mining operation with a 12-year life span. The Madsen Gold Project produced 2.5 million ounces between 1938 and 1976. It is one of two mines that accounted for 85% of the historical production in the Red Lake camp. The other was Goldcorp’s Red Lake Mine Complex. Coming up to 17 years after it acquired the property, Rubicon Minerals Corp. [RMX-TSX; RBYCF-OTC] is continuing with development work at is Phoenix Gold Project, which was previously known as the McFinley property. (McFinley was originally staked way back in 1922). Rubicon recently processed bulk sample mineralized material taken from the F2 deposit at the Pheonix project. The company said it planned to process between 25,000 and 30,000 tonnes of mineralized material from three test stopes. In a November 2018 press release, the company said results from the bulk sample validated the NI 43-101 compliant estimated resource of 1.37 million tonnes, grading 6.37 g/t gold or 281,000 ounces of gold (measured and indicated). The company is planning to release an updated mineral resource estimate in the first half of 2019. It said the new estimate will be based in part on 20,000 metres of infill and step-out drilling completed in 2018. Pacton Gold Inc. [PAC-TSXV, PACXF-OTC] said in a February 14, 2019 press release it has struck a deal to purchase additional mineral claims in the Red Lake District. Pacton said it has increased its land position to approximately 15,000 hectares by picking up 17 mineral claims that are strategically located between Pure Gold’s Madsen property, including the Wedge Zone, and Great Bear Resources Ltd.’s [GBR-TSXV] Dixie Lake gold discovery. Pacton said it is now compiling historical data and formulating plans for exploration work in 2019 to advance the project. Meanwhile, Nexus Gold has snapped up 1,345 hectares of ground in the heart of the Red Lake gold camp known as the McKenzie gold project. Prior to the acquisition, Nexus Gold had been focused on West Africa, primarily Burkina Faso. Speaking about the McKenzie Project, Klenman said a 2017 ground reconnaissance program resulted in the prospecting discovery, with high-grade samples, returning up to 313 g/t gold. “A new showing on the southwest corner of McKenzie Island, located on the northern portion of the project area, was also discovered during this program and returned multiple high-grade samples ranging from 9.37 g/t gold to 331 g/t gold,” he said. In a February 12, 2019 press release, Nexus said it is proceeding with a non-brokered private placement of 17.4 million units at $0.115 per unit in a move to raise $2 million for exploration at McKenzie and other projects in the company’s portfolio. Meanwhile, with backing from Bay Street financier Rob McEwen, Great Bear Resources has embarked on a fully-funded 30,000-metre drill program at its Dixie Lake Project. The program is expected to consist of 150 drill holes and will likely continue through 2019 and 2020. Great Bear said it was planning to add a second drill rig in 2019 to accelerate the work.